Ballarat High School, Sturt Street West, Ballarat, City of Ballarat. 1. 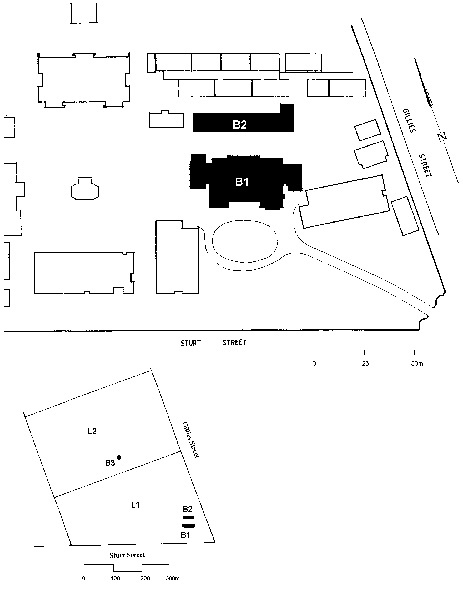 All of the buildings marked B 1 (Main Building), B 2 (Locker Rooms) and B 3 (Silo approximately 200 metres west of Gillies Street) on Diagram 606982 held by the Executive Director. 2. 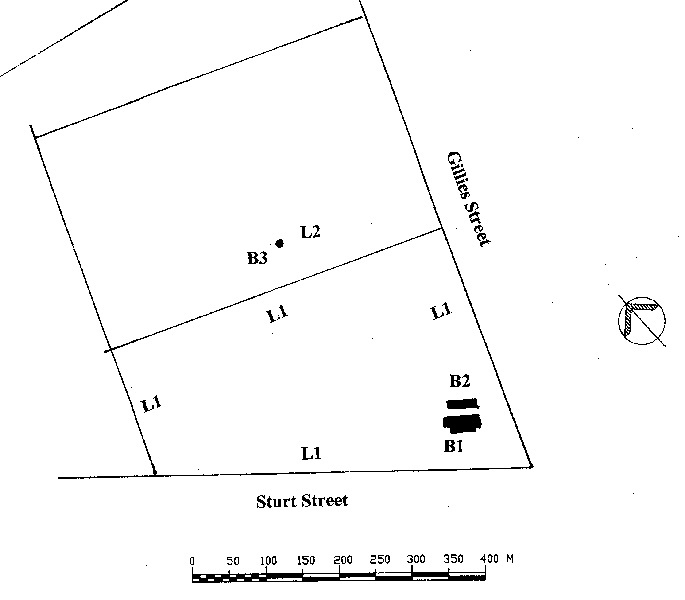 All of the land marked L 1 on Diagram 606982 held by the Executive Director being part of Crown Allotment 6C and L 2 being a 3 metre curtilage measured from the base of the silo (B 3) and being part of Crown Allotment 6B. At the turn of the century, Ballarat was Australia's largest inland town and Victoria's second largest city with a population of 46,000. Although mining had waned, the town had increased as a manufacturing centre, with foundries and metal works producing transport, agricultural, mining and industrial equipment. A meatworks, a tannery a bone-mill, a soap-works, several coachbuilders, and two breweries provided employment for 2965 workers in 1901. Ballarat had always been strong as an educational centre, with flourishing private schools as well as government primary schools. Ballarat, surrounded by prosperous farming communities and linked to other centres to the north and west by rail, was very suitable as a centre both for teacher training and for agricultural education. The history of secondary education in Victoria is largely a development of the twentieth century. Primary education for all was the first aim of the Victorian government education system. From the passing of the Education Act of 1872, the provision of 'free, compulsory and secular' education for Victorian children took precedence over higher levels of study. By the early years of the twentieth century, however, the Victorian government was preparing to extend education to students past the primary years. Their objective was not at first to provide secondary education for all. The two areas of post-primary education at first considered were technical and teacher training. The opening of the Melbourne Continuation School in the old Model School building in Spring Street in 1905 marked the beginning of state secondary education in Victoria. It was designed as a training college for pupil-teachers, but also accepted a small number of scholarship holders who were prepared for university entrance. Continuation Schools were intended to bridge the gap between primary schools and technical schools for those pupils who were being prepared for work in the manual trades. The establishment of agricultural high schools was an initiative of the Director of Education, Frank Tate. The first of these at Warrnambool and Sale were opened in April 1907. The syllabus directed that students spend one third of their time on cultural subjects, one third on the study of science and mathematics and one third on the school farm. However, by 1912 it was recognised that there was no public demand for agricultural education and no schools other than the ten already established were to be set up. The ten were Sale, Warrnambool, Ballarat, Leongatha, Colac, Mildura, Shepparton, Wangaratta, Warragul and Mansfield. These gradually became standard district high schools. The curriculum of the district high schools were at first limited to the training of teachers, the study of agriculture and the bridging of the gap between the primary school and the technical college. The Education Act of 1910 authorised the Governor in -Council to establish higher elementary schools and district high schools; continuation classes; and preparatory trade classes, trade schools and technical schools. High schools charged fees and students were required to pay additional sums for uniforms and books. Scholarships were available to the most brilliant of the working class but the fees excluded most working class children. The working classes were not given access to secondary education, but encouraged to participate in technical education. In Victoria, the independent schools who prepared students for the public examinations were the main providers of secondary education. The expansion of the public sector into secondary education was seen as a threat to private enterprise and was strongly resisted. Once high schools became more accessible, many middle class families used a combination of state and private education, moving their children to the private school system for the final two or four years of secondary schooling. More affluent families continued to use private schools for the whole of their children's education. In the absence of a high school, particularly in country areas, non-Catholic children were frequently sent to the local Catholic school. The Catholic schools did charge fees but these were generally very low compared with other independent schools. The state secondary system aimed only at filling the gaps in secondary school provision left by the independent school system. As Janet McCalman points out, it was assumed that the poor and clever could win scholarships to government or private schools. The government itself offered some scholarships which could be taken up at registered i.e. independent schools or at a few high schools which prepared students for entrance to the University of Melbourne. It was not until the middle of the twentieth century that the state began to provide secondary education across the state. In Ballarat, the first government post primary school was opened on Tuesday 16 April 1907 as a Continuation School in premises at 208 Sturt Street. The Warrnambool and Sale Agricultural High Schools began on 15 April and the Bendigo Continuation School on 27 May 1907. Prospective students at Ballarat had have completed the Merit Certificate or to convince the headmaster and the District Inspectors that they were suitable candidates for teaching. By 1909 about half the students came from country areas either close to Ballarat such as Clarendon, Buninyong and Creswick or further away such as Horsham, Murtoa and Warracknabeal. Those from distant areas took lodgings in Ballarat. The Continuation School moved to Dana Street Primary School in a building facing Doveton Street in September 1907. There had been pressure from Ballarat residents for an agricultural high school as early as 1894. After much deliberation, Ballarat Council in 1907 agreed to supply to the Education Department land from the Prince of Wales Park two miles west of central Ballarat at Alfredton as well as a financial contribution to the cost of the building. The contribution of the Council was the land and £3000 while the State government promised £7000. This was a substantial sum and far greater than the £3000-4000 spent of other agricultural high schools at that time. Ballarat was to be the model for agricultural high schools in the state. The Director of Education, Mr Frank Tate stated that ?it was the intention of the Education Department to develop it as the leading high school in the State. The curriculum was to include three types of courses? agricultural education for boys, domestic arts for girls and primary teacher training courses for boys and girls. Tenders were called for the building in December 1908 and the foundation stone laid on 17 March 1909. The building was ready for occupation in April 1910. It consisted of an assembly hall, five classrooms, a sloyd room and laboratories for chemistry, physics as well as art, cookery and dining rooms. The building was destroyed by fire on 29 July 1915,leaving only the brick walls still standing. 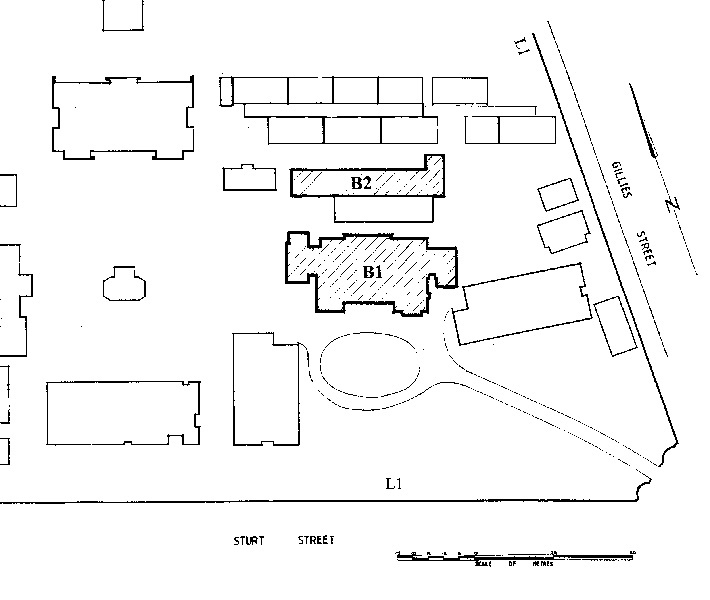 A larger building was planned to replace it and tenders were let in February 1916. The new building was completed by the beginning of the 1917 school year and contained 30 rooms. The exterior shell was retained but the interior had to be re-constructed and two side wings were added, set back from the original facade. The architect for the original building was John Hudson Marsden. Born in 1844, Marsden joined the Public Works Department in 1872. He was the architect in charge of the western district of the state and was responsible for a number of important public buildings such as the Maryborough Court House and Post Office, the Castlemaine Court House (1877), the Carlton Post Office (1883) and the Terang Post Office (1903). The design of the Ballarat Agricultural High School was one of his last works before he retired in 1909. The architect responsible for the 1916 re-building was H. J. Kerr, son of Peter Kerr, one of the architects for Parliament House, Melbourne. H. J. Kerr worked in the Department from 1878 and assisted on the Houses of Parliament . Many of the drawings for the superstructure of the west facade of Parliament House were signed by H. J. Kerr, who also executed the drawings for the south-east wing in 1891-94. The assembly hall was relocated on the first floor in the new building. It was panelled in Australian hardwoods and was decorated with many Art Nouveau features, including stained glass windows. The hall was named Peacock Hall after the current Premier of Victoria and local member of Parliament, Sir Alexander Peacock, who opened the new school building on 4 April 1917. Built during World War I, the hall is particularly associated with the School?s strong military tradition. The school had a cadet corps from 1907. In the conscription campaign of 1917, it was believed that support for conscription within the school was 20 to 1. Peacock Hall contains memorials to honour both academic achievements and military service by former students. One polished timber Honour Board listed those who died during World War I. A memorial mosaic mural tablet by well-known Melbourne artist George Dancey. The theme of the mural was the triumph of good over evil. Two World War II Honour Boards were unveiled on 14 November 1947. One contained the names of 57 servicemen and one nursing sister who died during World War II: the other listed 632 returned service men and women. In both wars, patriotic activity was encouraged and students were involved in war relief work, fund raising and collecting waste materials. 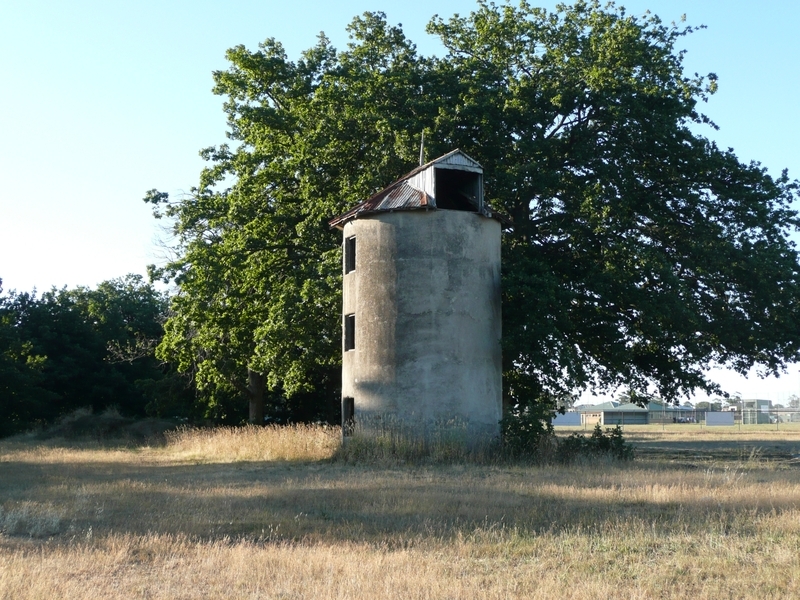 The concrete silo constructed c. 1913 is the only remaining structure of the Ballarat Agricultural High School farm which was conducted from 1910 to 1927. It predates the re-building of the main building (1916) and is the earliest intact structure remaining on the farm site. A photograph taken in 1913 show two silos and a large shed north of the school buildings. Only one concrete silo (c.1913) remains on land now returned to the Ballarat City Council for recreational purposes. Although this has been separated from the school grounds since the reversion of the farm land to the Council, it is a remnant which demonstrates directly the Agricultural School period (1910-27) and as such is historically significant at a State level. This building directly behind the Administration Building is a long low timber building with gabled roof clad in galvanised iron. Its dimensions were 120 feet by 24 feet. It now contains locker rooms, canteen and music room. The building was constructed by staff and students in 1910 as bicycle and shelter sheds and locker rooms. The 1910 agricultural class consisted of 22 male students, less than one tenth of the school population. During the mornings these boys studied with the rest of the school but in the afternoons they worked on the farm or in constructing the farm buildings. Their two-year course included woodwork, building construction, sheetmetal work and blacksmithing. Presumably the practical building skills learnt on the construction of the shelter shed building in 1910 were then used in the construction of the farm buildings in 1911. The locker rooms have undergone considerable alteration. 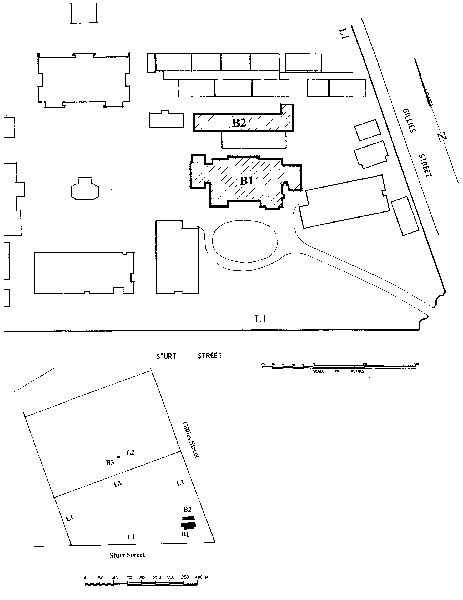 The canteen is in the central section and a glass-roofed assembly hall attached to the south. The original form of the building is however still obvious and internally some detail is intact such as the timber lined walls and ceilings and stable half-doors to the remaining locker rooms. This building is the earliest on the site but has undergone much alteration.. In the 1950s a prefabricated Bristol classroom to house eighty students was brought on site. Postwar shortages of building materials and labour and huge increases in the school-age population partly from natural increase and partly from migration led to a severe shortage of school buildings in Victoria. After the Second World War, the Bristol Aircraft Company diverted their capacity for aluminium production to produce sheet aluminium and other products. These aluminium units were prefabricated by the Bristol Aircraft Company in England and imported for the Education Department to alleviate overcrowding in schools. Memorial gates were constructed from funds donated by the students in 1939. These are of contributory significance. 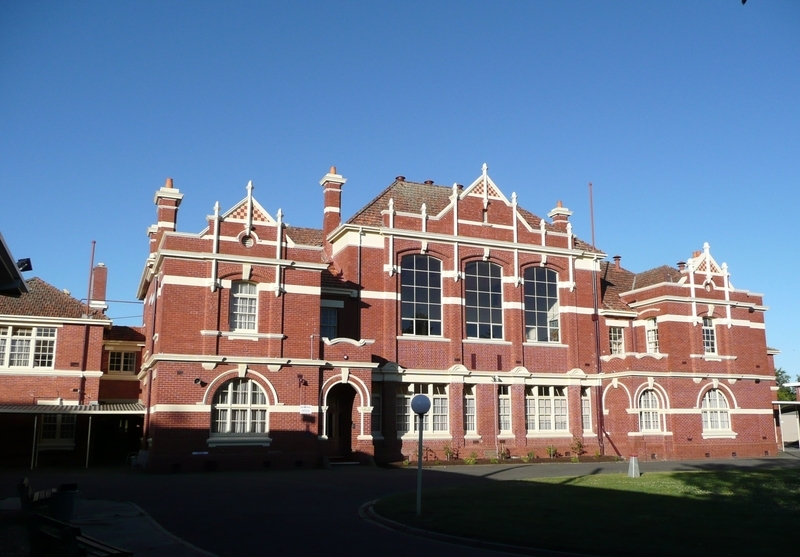 The Ballarat High School is important in the history of secondary education in Victoria as one of the first government secondary schools in the State. Founded as a continuation school for the training of teachers, Ballarat High School became one of the first purpose-built agricultural high schools. The Peacock Hall is historically important as a memorial to those who served in World War I and II, demonstrating the involvement and experience of schoolchildren in the war effort. 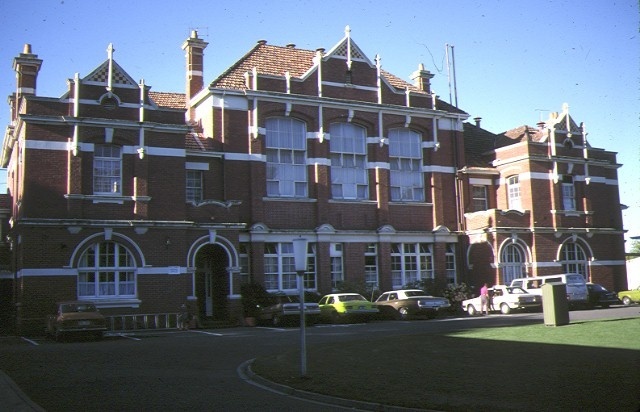 The Ballarat High School is historically important as an early agricultural high school whose foundation in 1907 reflected the importance of the agricultural sector in the early twentieth century. The Ballarat High School, designed by the Public Works Department architect John Hudson Marsden in Edwardian style exhibits an unusual integration of features in its main building and especially its assembly hall, which is decorated with timber panelling and leadlight windows. * Demolition, removal or alteration of buildings not specified in the extent of registration. * Painting of previously painted surfaces provided that preparation or painting does not remove evidence of the original paint or other decorative scheme. * Landscaping and gardening works. * Installation, removal or replacement of carpets and/or flexible floor coverings, curtain track, rods, blinds and other window dressings, hooks, nails and other devices for the hanging of mirrors, paintings and other wall mounted artworks. * Refurbishment of bathrooms, toilets and kitchens including removal, installation or replacement of sanitary fixtures and associated piping, mirrors, wall and floor coverings, kitchen benches and fixtures including sinks, stoves, ovens, refrigerators, dishwashers etc and associated plumbing and wiring. * Installation, removal or replacement of electrical wiring provided that all new wiring is fully concealed and any original light switches, pull cords, push buttons or power outlets are retained in-situ. Original tender accepted 26 November 1908 for Peter Rodger to build the Agricultural High School. "Geelong Advertiser"; 27 November 1908 page 3. Opened August 1910.